A system to end the drawing of lots to separate teams that finish level in tournament groups is being looked at by the Confederation of African Football. The process has been questioned after it was used to send Mali home from the Africa Cup of Nations on Thursday at the expense of Guinea in Group D.
The teams finished level on points, goal difference and goals scored. "We have to stand by the regulation but also think about how we improve it," said Caf media director Junior Binyam. "It's not fair to have a team going out like this. It really is the worst decision - to have to make a decision this way - because everybody expected it would be decided on the field." One representative from Guinea and Mali took part in Thursday's draw, which involved selecting balls from a bowl. Mali's football association president Boubacar Diarra went first and pulled out the ball that placed them third in the group. With Diarra in tears, Amara Dabo, financial director of the Guinea sports ministry, then drew the ball that confirmed his side in second place. Dabo said: "The god of football fortune has smiled upon Guinea after this hard long journey." While any potential rule change has come too late for Mali, Binyam believes it may have been removed by the time the next Nations Cup takes place in 2017. "The decision of the agenda is not mine but I think it's a matter of concern for members of both the organising committee and the Caf executive committee," the Cameroonian told BBC Sport. "Regulations are not static, they are dynamic. We will find a way of improving the criteria to make them be decided by actions on the field." Binyam mooted a variety of options - from the number of shots through to the amount of ball possession - but indicated that any solution was a long way from being confirmed. Instead, the priority is to ensure that the drawing of lots, which took place for the third time in Nations Cup history, does not happen again. The most recent occurrence was in 1988, when Algeria went through at the expense of Ivory Coast. In 1972, Congo progressed from the group stages after 'winning' the drawing of lots ahead of Morocco and then went on to win the competition. "The situation that has happened in Group D will make people think twice," added Binyam. "I am sure that in the weeks and months ahead, we don't have the same situation in two years' time." During the 2014 World Cup qualifying campaign, world football's governing body Fifa also made provision for the drawing of lots to divide teams that finished level in every other way. 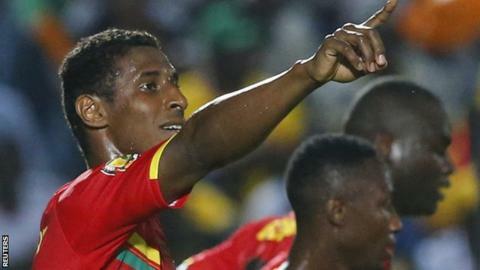 Guinea will meet Group C winners Ghana in this weekend's quarter-finals in host nation Equatorial Guinea.